Svoge and Svidnya are located on the northern border of the polyphonic Shope region. Situated on both banks of the Iskar River, they strive to preserve their unique folk heritage. 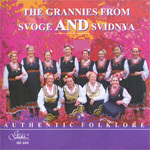 The singers of the Svoge Group have worked together since 1980, and those from the Svidnya Troika – since 1981. Their age ranges from 64 to 81 years. Many of the singers remember the time when these songs were part of their way of living: ritual songs, songs for harvest time, pastoral, working-bee, horo, at the table songs. For this reason they sound so authentic ! 01 Mori, momche dava 1'30"
02 Gyurgelena kon vodila 1'22"
08 Poshli sa momi 1'04"
12 Deka Yana prominala 1'21"
13 Napred, napred, kumitse 1'12"
14 Zalyulia se zlatna lyulkya 1'17"
15 Dobar vecher, Eleno nevesto 1'05"
16 Dude le, devokyo 1'53"
24 Dve nevesti yoro vodat 0'57"
26 Site sa momi na sedenkyata 1'38"
29 Chereshchitse, goro le 1'06"
31 Nishna se zlatna yabalka 2'23"
33 Shetna se zlatna yabalka 1'33"
34 Slantse se, Stano, nadnosi 0'53"
35 Golem se sabor praveshe 1'04"
36 Zvanche mi drunka 1'30"